One of the best Neapolitan pizzas in Berlin, cooked in the original wood oven. You will find also amazing antipasti and desserts. Some pizzas are just unforgettable and so delicious that you cannot wait to eat one again. This was the effect that pizza ”Maria Carolina” (or Neapolitan gateau) made to us. It is hard to say, maybe because of the previously prepared and roasted potatoes, because of the pieces of sausage with finocchiella, placed in gut by the owners themselves, spread over the fior di latte produced in a cheese factory nearby Salerno. Or maybe because of the breadcrumbs that covers the pizza giving a unique flavour that lasts over the mere tasting. what is sure is that in Berlin we rarely can feel so gratified after eating. It is even more impressing to know that pizza Maria Carolina is not an usual kind of pizza at Prometeo. Emiliano, the owner, keeps a various menu a la carte that changes according to the season’s products and to the daily ispiration. 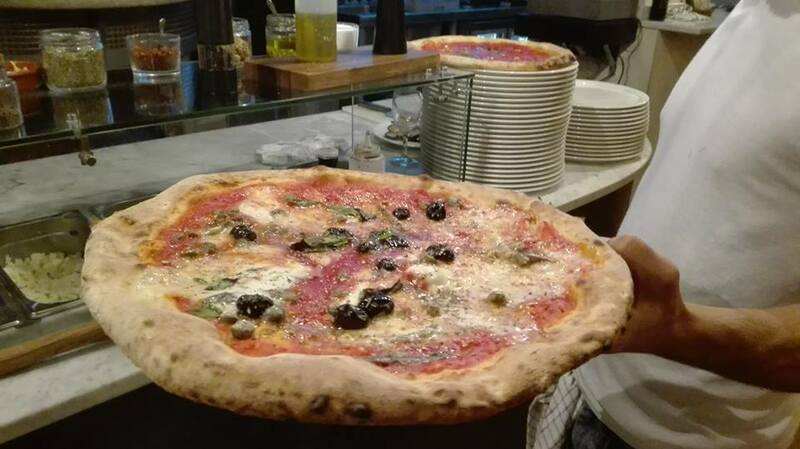 It is easy to reach the top when you have a 72 hours rising time dough, a wood-fired oven cerified by the Associazione Verace Pizza Napoletana and a team of expert pizza makers able to handle the dough. ”I fought for one year to gain the certification of the wood-fired oven providing it with the necessary filters and barrels.” Says Emiliano. ”It was easier to put a gas oven. But the pizza would not be the same. So I set up a Stefano Ferrara oven. It comes from Quarto, a town near Napoli. It cooks pizzas in about 60 and 90 seconds at 500 degrees leaving all the flavours to the dough, mozzarella and tomatoes. Prometeo’s pizza dough is authentic from Neaples, soft and elastic. The crust is 1-2 cm large. Moreover, every topping is prepared and cooked by Emiliano’s mother who was previously a baker for twenty years at Castelli Romani. Prometeo’s pizza. There are the traditional pizzas such as margherita, marinara, mashrooms, four cheeses and the special ones such as Norma (tomato sauce, mozzarella and salty ricotta), broccoli and sausage, radicchio and blue cheese, taleggio cheese and artichokes, parmigiana, bufala with cherry tomatoes from Piennello DOP, pepper and chopped speck which seems to be the oldest kind of Neapolitan pizza (according to some scripts from 1500). Also, they have the Neapolitan fried calzone filled with tomato sauce, mozzarella, ricotta and salami. The prices vary from 6,50 euros for the margherita to 12,50 euros for the Parma ham, Rucola and bufala. Not that expensive for the average of the restaurants in town. Starters, main dishes and desserts. The supplì (rice croquette) have the lemon aftertaste from the Rome tradition, the aubergine Parmigiana is served as main dishes, the mixed fried vegetables and the creamy soups show the cooks’ abilities beyond the pizza. Prometeo has also some dishes on the menu a la carte. The desserts are simply extraordinary: the panna cotta, the ricotta pie and the tiramisù are the proof that there is a baker behind the counter. Behind the sign. Prometeo was opened on May 2016 after two years of working. It is the result of the owner’s perseverance, sacrifice and research of perfection, which helped him to understand the chemistry for an excellent dough. ”I trained in Neaples at the Associazione verace pizza Napoletana to discover every secret of the dough, rising time, maturation and preparation of the loaf. I learned to know the authentic tastes of the tomato and mozzarella. It is something that I assume essential to certify the quality of the products we serve everyday and the team’s skills”. Why this name ”Prometeo’? ”It is an interesting figure from our mythology, it is a symbol of the fight for the progress and freedom from the power. He stole the God’s fire to give it to the men. Without that fire we would not have had our Neapolitan pizza. There is more. Prometeo was a Titan and Titan is a Saturn’s moon. Exactly when I was working on the pizzeria’s opening, the probe Cassini photographed Saturn and its moon Titan. A stunning image of blue and yellow hydrocarbons. So I decided ti paint the walls with those colours. The painting was made by two Italian artists who worked with chalk and paints. I would like to add my love for music. Prometeo is the title of a Symhonic poem by Franz Liszt, composed between 1850 and 1855. It is also a music poem by the Venetian composer Luigi Nono, which I love. Well, many stories, one centre: the love for the pizza. The good one. And our clients’ wellness. Hoping that, with time, everyone will try our genuine food. Open everyday from 17.30. Sunday closed.